• design guidelines for learning quests and activities in virtual worlds. The authors also examine the theories and associated design principles used to create embedded assessments in virtual worlds. Finally, a framework and methodology is provided to assist professionals in evaluating "off-the-shelf" virtual worlds for use in educational and training settings. 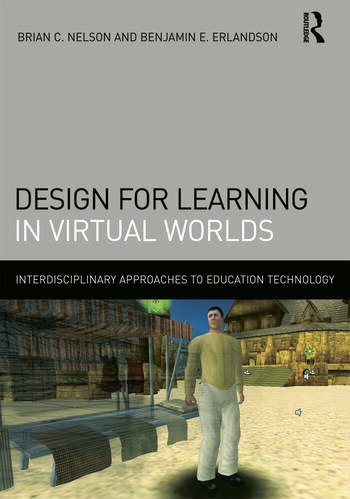 Design for Learning in Virtual Worlds will be invaluable both as a professional resource and as a textbook for courses within Educational Technology, Learning Sciences, and Library Media programs that focus on gaming or online learning environments. Brian C. Nelson is Associate Professor of Educational Technology at Arizona State University. An instructional designer and learning theorist, he has published and presented extensively on the viability of educational virtual worlds for situated inquiry learning and assessment. Dr. Nelson’s recent writing addresses issues related to the design and evaluation of educational games, with a focus on theory-based design principles. He is currently a Co-Principal Investigator on the SAVE Science Virtual World project, and was the Project Designer on the River City project. He was a Co-Principal Investigator on two MacArthur Foundation Digital Learning grants and was also a Co-Principal Investigator on the SURGE project, creating video games to teach high school physics. Benjamin E. Erlandson is Assistant Professor of Instructional Science and Technology with an emphasis in Digital Media in the School of Information, Technology, and Communication Design (ITCD) at California State University, Monterey Bay. In addition to teaching several courses in interactive media design/development and instructional design, Dr. Erlandson runs the Virtual Environments for Situated Inquiry of Complexity (VESIC) Lab, conducting various research studies investigating the usefulness of meso-immersive 2D and 3D virtual environments—much like those used for many popular computer games—for learning about complex systems.